The water was dead flat at the leap in Kurnell last Saturday, excellent conditions for a drift dive to the Steps. Initially we had thought of giving Cape Solander a try (I have not been there myself yet, but definitely keen to change that! ), but apparently the road to the pick nick area has been blocked by large boulders recently. We jumped in from the lower ledge at the leap, and on the surface I finally got my camera ready, turned on the strobe…well, tried to. With still more or less closed eyes I had installed the batteries while having breakfast, and for once I did not check if everything worked properly. One of the batteries was installed upside down, and instead of a nice rig I found myself carrying a considerable rig to be used with natural light only. We dropped down to the sand bed at 20m and followed it to the right for about five minutes. I like the little wall and sponge garden on that side of the entry point! The incoming tide was picking up and we did not fight against the current anymore but let it guide the way to the steps. We saw an amazing variety of underwater life. Apart from macro objects we were circled by a massive stingray, Alistair got hit on the back of his head by a cruising Port Jackson shark, I counted five weedy seadragons and close to the exit we met a giant cuttle who was willing to pose for a while before heading off. 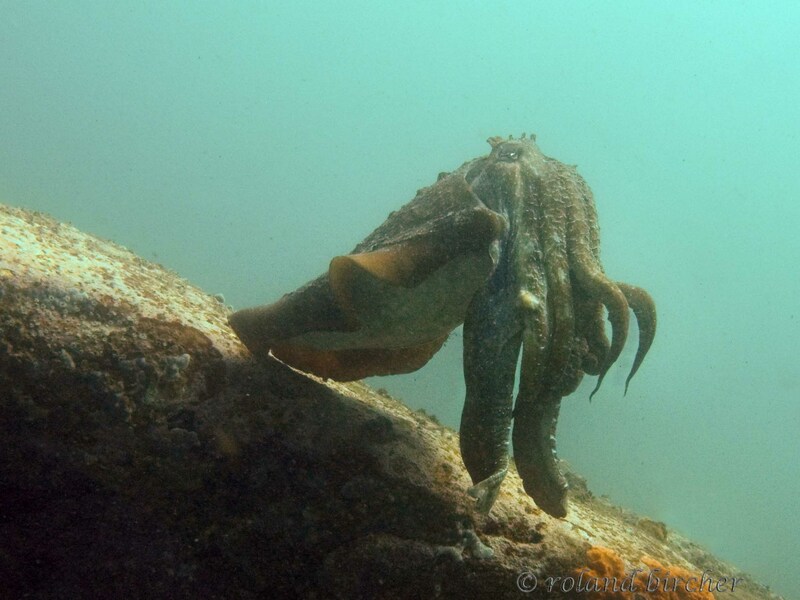 A great dive, very enjoyable and in terms of photography a certain challenge to work only with the available light. When working on the pictures in PS I appreciated for the first time that I am shooting raw when diving with the G9. The easy change of the whitebalance quickly brought some of the red colour back, at least for objects within a few meters. 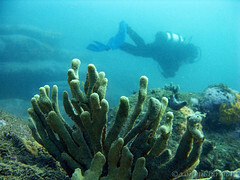 This entry was posted on June 30, 2008 at 7:37 pm and is filed under Divelog, Diving in Sydney, Underwater Photography. You can follow any responses to this entry through the RSS 2.0 feed. You can leave a response, or trackback from your own site.